March 13, 2019 at 10:40 am EDT in New York, NY. 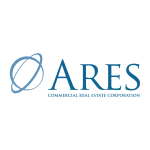 Investor Resources section of the Company’s website at www.arescre.com. Management Corporation. For more information, please visit www.arescre.com. made herein or on the webcast/conference call.